David has been the Chief Operating Officer for NHS Blackpool CCG since it was formed as a Wave 2 Pathfinder in January 2011. Previously, since 2002, David worked as the Director of Commissioning for Blackpool PCT. 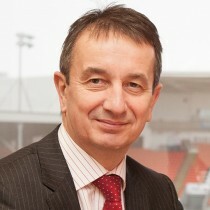 Prior to this, David has held a number of Board level and senior managerial positions in a number of organisations across the North West, including Chief Executive of a Primary Care Group, Director of Marketing and Contracting at a Community Trust and Marketing and Business Manager for the Royal Liverpool University Hospital.